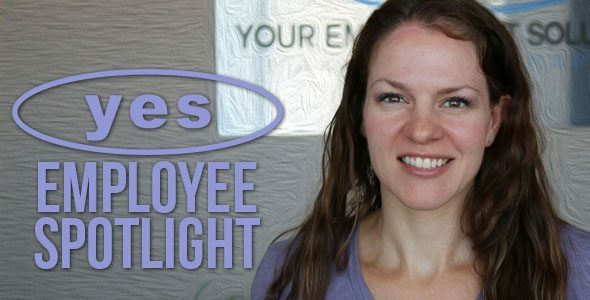 Our Spotlight Shines on an Awesome Utah Staffing Professional! This month's employee spotlight goes to Patricia Jones, a.k.a. Trish, Tricia, Pattycakes, or whatever other name we come up with that she'll actually respond to! Trish is an absolute asset to us here at YES Corporate. She is our go-to gal for anything from cleaning our offices, posting jobs, helping create promotional videos, to invoicing and covering duties for managers while they're out of town. She has been so flexible with us while constantly maintaining a smile and upbeat personality. YES just wouldn't be the same without her! 6. Laughing. I laugh at everything. 1. Working in the yard. 3. When people are late. The thing I like most about working at YES is the atmosphere and all the people, everyone is really nice and fun. I’m not sure what would make YES better. It is pretty great already. Just keep doing what you are doing. If I could meet anyone three-way tie. Jennifer Garner. She seems really nice and fun. Walt Disney. His mind was so creative and I would like to see what he thinks of the Disney parks now. J. K. Rowling. Well I would need to make sure I had my kids with me because she is just an amazing author and really brought back the love of reading to people everywhere. This is going to sound lame, but my favorite place is anyplace with my family. I do totally love Lake Powell, Spain, Hawaii, Disneyland and anyplace with a beach. 7. Word is you like to bake. What is the best dish you ever baked? I do make a really good Crème Brule, so that is probably the best. Just take one extra area every week and try to make it look better than it did. I would say yes do it. It is a great place to work and they really love what they do, which makes you love it too. 11. One of your many jobs at YES is to clean up after all of us. Who always has the messier office? The president of YES Reed Laws or the vice president Kerry Westenskow? Who has the cleanest office out of everyone? Well I’m not going to say who has the messiest office, but I will tell you it isn’t Reed or Kerry and the person with the cleanest office is Alison. My office? Really? Well, I'm glad somebody noticed! Thank you Tricia for all that you do to help make Your Employment solutions the best staffing agency in Utah!